A vegan strawberry cake recipe that is bursting with strawberry flavor. The secret is freeze dried strawberries and strawberry extract. The same or better than any boxed strawberry cake mix. Purchase freeze dried strawberries at Amazon.com by following the link below and help contribute to this website. Servings:13. Per Serving (1 Cupcake): 153 Calories, 3g Fat, 29.5g Carbohydrates, 1.50g Protein, .50g Fiber, 12.5g Sugar. In a medium sized mixing bowl add dry ingredients: flour, sugar, salt, baking soda and powder. Now, in a food processor, chop the freeze dried strawberries into a powder, they don't have to be too finely chopped, a few chunk look nice in the cake. Place this into the mixing bowl with the rest of the dry ingredients and stir all of it together. Next, in a separate small mixing bowl combine the wet ingredients: water, butter, oil, strawberry extract, lemon juice and food coloring. Stir the wet ingredients together. Now pour the wet ingredients into the mixing bowl with the dry. Take special care not to over mix the ingredients. DO NOT use an electric mixer. Stir it with a big spoon and stir slowly until ingredients are well combined with a few lumps. For A Two Layer Cake: For a two layer cake as pictured above pour the batter into an 8X2 inch, greased and floured round cake pan and place in the oven and bake for 30 to 35 minutes or until a tooth pick can be inserted in the middle and it comes out clean. Repeat this recipe to get the second layer. Do not double this recipe. If you try to mix more than one recipe at a time it causes the cake to become too tough or in some cases too gummy. After they are out of the oven let cool for 30 minutes before icing them. 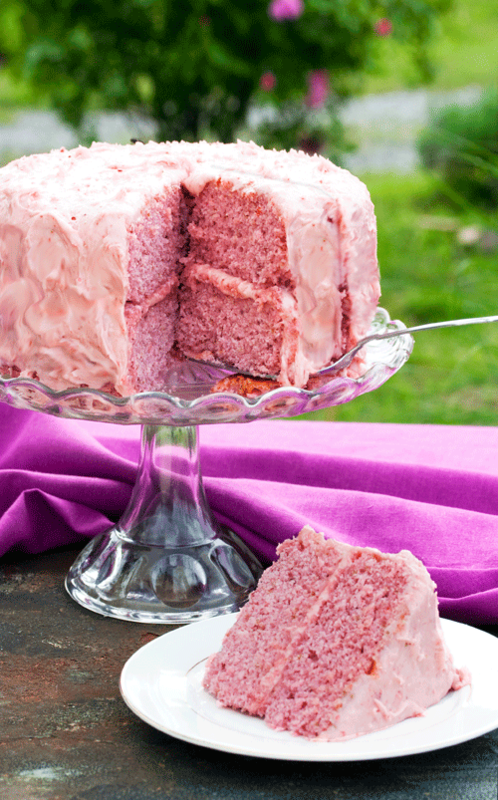 One recipe of MVC's Strawberry Icing will ice the cake perfectly. For Cupcakes: If you are making cupcakes, insert cupcake papers into 13 cupcake wells. Next pour batter into wells, filling them 3/4 the way. Place into oven and cook 20 to 25 minutes or until a tooth pick can be inserted in the middle and it comes out clean. After they are out of the oven let cool for 30 minutes before icing them with MVC's Strawberry Icing. Want to know what others thought about this recipe? Would you like to comment on this recipe? Go to the Vegan Strawberry Cake blog entry.